While it’s not a seemingly exclusive club, it was an expensive one. 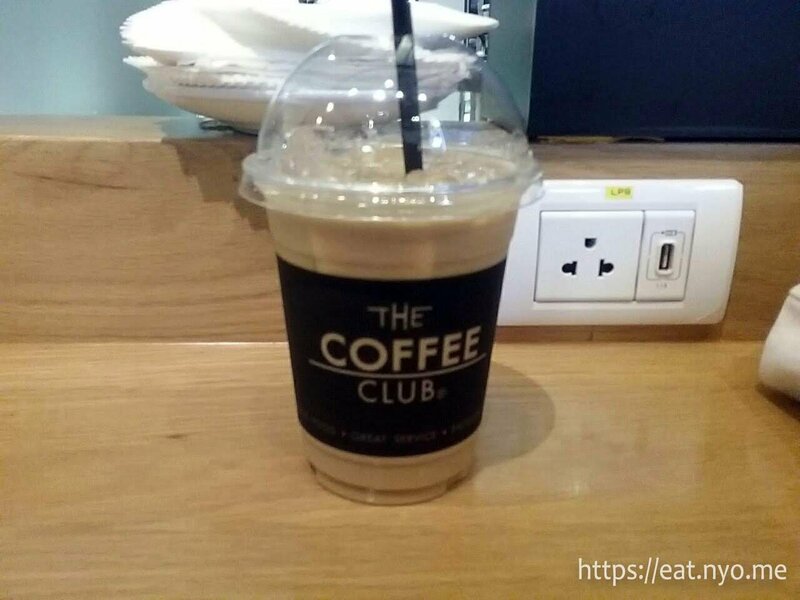 The Coffee Club offers a lot of coffee variants from the usual espresso-based drinks to local coffees and teas. They also have a lot of sandwiches, some sounding interesting. Sadly, I didn’t have a lot of Baht left. With the limited Baht I had, I decided to try their Iced Classic Thai Coffee (160 Baht). The Iced Classic Thai Coffee was already mixed with milk, but I don’t think there’s sugar in it. Nevertheless, it was a milky-chocolatey coffee, a bit less fruity than the hot Thai coffee I had before. It would almost pass as a mocha or a chocolate latte for me. It wasn’t plenty, though, maybe a medium but definitely not a venti compared to local popular coffee shop volume. I paid 171 Baht after taxes this cup of coffee. That was over three times the amount I paid at already seemingly expensive Galanan na Wanwaan at Megabangna. Despite that, since I was able to rest here, plug in, and use the Airport WiFi for all my devices until my plane was ready to board. Although it seems I’m unfairly grading my previous blog, I really did find the service and ambiance of this place much more relaxing. Perhaps its primary lucky advantage was that it was located very close to my gate. Hopefully, that justifies why I’m giving The Coffee Club in Suvarnabhumi airport a thumbs up. As I conclude my odyssey in Thailand, I guess I’d also conclude with an overall impression. Nobody should take my adventures here as a genuine end-all food guide in Thailand. I definitely was not able to experience Thailand as a tourist. As this was mostly a business trip, all of my food adventures had been mostly controlled by time and energy constraints. It was a lonely trip and definitely not exemplary of the country, pretty much like my odyssey in the Netherlands. It was also an expensive trip due to the said constraints. I’m sure there are much more enjoyable and affordable food places to go to, especially within the famous night and river markets. Despite that, I found that Thai food in general is generous in serving and quite flavorful, especially on the spicy and savory flavors. My Betrothed was right in that I’d probably not survive the basic spicy level of Thai food. However, I definitely enjoy the nutty-savory side present in a lot of dishes. I also like that the sweetness of the food here is not white-sugar sweet as per most Filipino or Western food. I also hope this odyssey will serve a guide for those who will find themselves in a similar controlled situation when visiting Thailand. Though I’d rather not visit this country again alone; I’m sure I’ll have a better time and experience if my Betrothed is with me. Maybe next time. Recommended for: Passengers with nearby boarding gate wanting to relax. Not recommended for: Travelers whose boarding gate is far. Smart nomnomnom tip: You can take your coffee to your plane if you don’t finish it.